Territory War is one of the mid- to end-game features of Perfect World International. The Kingdom Map can be accessed through the World Map. The land is made of 44 territories, with divided into three grades. 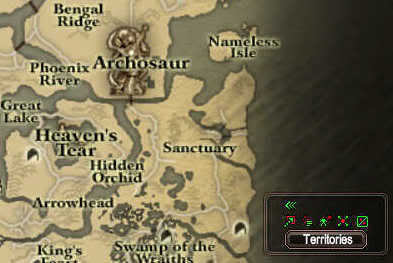 Archosaur and Thousand Streams make up the two level 1 territories. The four other cities, Ethersword, Plume, Lost, and Dreamweaver, make up the four level 2 territories. The remaining thirty eight territories are level 3. Level 3 Territories provide 10,000,000 per week occupied, level 2 Territories 20,000,000 per week occupied, and level 1 Territories 30,000,000 per week occupied. 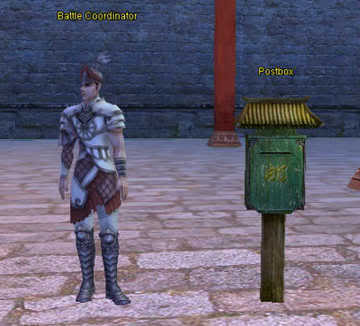 Payment is sent by in-game mail to the guildmaster every Friday at noon, server time. Members of the ruling guild pay no fee to teleport to the territory they occupy. Teleport by selecting the territory from the Kingdom Map accessed though the World Map. Free teleport uses the Town Portal skill, which has a 1 hour cooldown time. Declaration of War time is fixed every week. The Guildmaster can declare war at the "Battle Coordinator NPC" in any of the six cities. It is possible for any eligible guild member to enter territory war at the "Battle Coordinator NPC" or any one of the 45 teleporter NPCs on the map. Each week, a guild can only attack one territory. *A guild with no territory can only attack a level 3 territory. *A guild with territory, can only attack neighboring territories. *To take a level 2 territory, a guild needs to control two territories, with at least one bordering the level 2 territory. 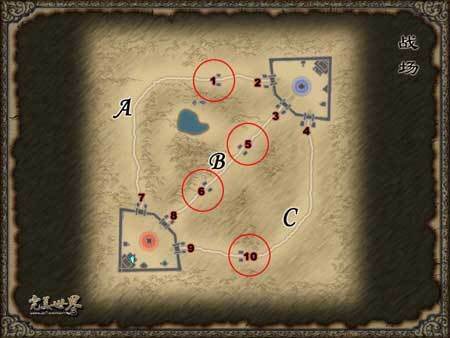 *To take a level 1 territory, a guild needs to control three territories, with at least one bordering the level 1 territory. Only players who have been in the guild for 100 hours are eligible by the Perfect World battle system to enter the Territory War battlefield. The cut off date is Monday at 4:00PM (20:00) server time. Starting bids for a level 3 territory is 500,000, a level 2 territory is 1 million, and a level 1 territory is 2 million. A minimum of 100,000 is required to outbid another guild for the right to battle. Bidding will be extended by 20 minutes from each bid past the Territory War declaration period, up to two hours. After winning a Territory War battle, a maximum of 90% of the bid up to to a limit of the 180,000 gold return cap for the territory will be refunded. Refund amount by the Perfect World system is dependent on the number and average level of guild members that have been in the guild for over 100 hours and logged in at least once per week. There are 7 scheduled times of 3 hours duration for Territory War, and 7 slots for each time. The Territory War system can schedule 3 battle declarations against one guild owning 3 or more territories at the same time. We are only allowed to defend 3 times in all for 9 battles per week. A maximum of 80 guild members can participate in a Territory War battle. Perfect World will send a global server notice that Territory War is about to start. Players will be able to freely enter and leave any initiated battle that is still taking place. Enter the battlefield at any of the "Battle Coordinator NPCs" or teleport NPCs. The objective in an unoccupied territory is to defeat all the monsters in the map including a boss, under the three hour time limit. Difficulty progresses from level 3 unoccupied territories being easiest, to level 1 territories being the hardest. 1. Upon entering the battlefield, chi is set to zero. Embrace is not enabled. 2. It is possible to jump, but not to fly. It's possible and suggested to use mounts for scouting. 3. Death on the battlefield will not cause experience loss. Resurrection, revival or re-spawn at the entry point, are all available on the battlefield. 4. If a client is disconnected, it's possible to reenter the battlefield by talking to a "Battle Coordinator NPC" or teleporter NPC. Defeat all monster on battlefield map within three hours. In Territory War between guilds, both sides will have a base with a Central Building that looks like a crystal on a platform. The attacker's base on the map and play names will be red, and the defenders will be blue. Destroying the Central Building of the opposing base will lead to instant victory. At the end of three hours, the defenders will keep their territory if no bases have been destroyed. Bases have high health and are defended by powerful turrets, but enemy catapults have high damage against defensive structures. The ordinary strategic goal then, is to send catapults into the enemy base, while defending against against enemy catapults. The battlefield is 1 km square with the bases diagonally placed, and has 3 paths leading to the 3 gates on each base. Catapults are only able to travel along the paths, to reach the opposing base. 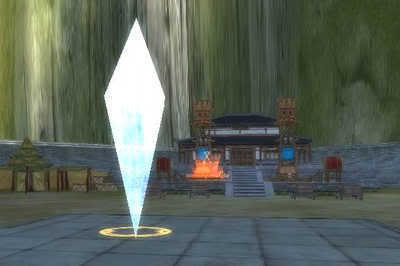 *One central crystal building, which if destroyed, will result in the immediate victory of the one who destroyed the crystal. *Two powerful guard towers protecting the respawn point. *4 Arrow Tower construction points. There are 14 Construction points for each side, where one of three types of towers can be built. Four are inside the stronghold, two each are outside each gate, and two are on the central path out, and one each on the side paths. After a tower is destroyed, it cannot be rebuilt. *Territory war merchant, who sells catapult control scrolls and can repair and has potions. One is needed each time in order to take control of a catapult. *Four Catapults that can be taken into the enemy base with a catapult control scroll. 3. Death on the battlefield will not cause experience loss. Resurrection, revival or res-pawn at the entry point, are all available on the battlefield. Revival or re-spawn will cause a 30 second seal state where it is not possible to attack or use skills. 5. It is unnecessary to press CTRL or change PK status in order to attack opposing players in Territory War. 6. Friendly players and catapults will display on the mini-map. Enemy players and catapults are hidden from the mini-map. If the offensive guild's Central Building is destroyed, then the defender wins. If the defender's Central Building is destroyed, then the attacked wins. If three hours pass, with no Central Building being destroyed, then the defender will win. 1. The price for the Arrow Tower construction is 100,000. They cannot be reconstructed if they are destroyed. 2. Click on an Arrow Tower foundation site to construct an Arrow Tower. After payment is deducted, Arrow Tower construction begins. The arrow towers have 30 seconds of the construction time. During construction, Arrow Towers are vulnerable, with their durability being 250,000, and their defense being 0. Please be wary of constructing an Arrow Tower, when enemies are nearby. 3. Health of a constructed Arrow Tower is 5 million HP. Health is regenerate in full after 20 minutes. Physical defense and magic defense are both 100,000. They have an attack range of 30 meters, and an agresssion range of 35 meters. a) Rapid-fire Tower: Damage is Character Level times 10. Attack frequency of 1.5 seconds. Single target. b) Stun Tower: Damage is Character Level times 10. Attack frequency of 6 seconds. Area of effect is 5 meters. Stun duration is 4 seconds. c) Explosive Tower: Damage is Character Level times 10. Attack frequency of 3 seconds. Area of effect is 5 meters. 1. "Catapult Scrolls" are 20,000 a piece, and are purchasable in the Territory Way battle map from the merchant near the spawn point. To use the catapult, click on the catapult to select it as the target. Use the catapult scroll, either from the inventory by right clicking (for right hand mouse users) or by hot-keying the scroll. It takes five seconds to activate the catapult. The catapult will follow the player automatically. Each player can only control one catapult. Each side can only have have a maximum of four catapults. Catapults which are destroyed will respawn at the base to which it belongs. Catapults will only attack enemy buildings. 2. The catapult will follow the player at a speed of 6 m/sec. If the catapult falls too far being the player, the catapult will go out of control of the player, and stop moving. Another catapult scroll will then be needed to reactivate the catapult. When a player stops moving, the catapult will automatically start attacking any enemy building within range. (Default attack priority is first Arrow Towers, Teleport Columns, and then the Central Building. Players can not take the initiative to select targets, but they can choose the appropriate location to bring the catapults to attack specific targets to achieve the objective). 3. The catapult, deals a single target damage of 100,000 HP, and attacks every three seconds. The health of the Central Building is 12 million HP, and physical and magic defense is 100,000. Health regenerates completely every two hours. damage is 60 percent of the players health. Attack frequency is once every three seconds. There are four Teleport Columns on the battlefield at Arrow Tower locations 1,5,6,10 along the three paths between the bases. Target them, and choose the dialogue to bind their location. Only one Teleport Column can be bound at a time. To bind a new one, manually delete the Transfer Column binding quest from the quest list. The binded Teleport Column is linked to the Teleport Portal inside the home base. The Teleport Portal can only send the player who bound it. It cannot send catapults. After transporting, the Transport Column binding quest is completed. Retarget and bind the Teleport Column to rebind its location. The Teleport Column can be destroyed by the enemy. If the Teleport Column is destroyed, it will automatically renew itself after five minutes. Mobs: 60-70 elite mobs per path lv 75-77. 10-20 patrols inside the castle. 1 boss lvl 79. Mobs: Agro Range: 100.00m. Agro Time: 100.00sec. Boss: Agro Range: 152.25m. Agro Time: 47.00sec. Note: Agro Range is much larger than normal mobs which is only around 36m. Players who are not careful will risk getting aggro of multiple mobs which can result in multiple deaths in the team. Basically, everything you need to know as stated above, is in these two videos I've posted below here. It explains in pretty good detail of what to expect and how TW looks like. Every TW map will have the basic look and layout. If we'll be attacking another faction here is most of the things you will need to know a bit more as well. Disclaimer: Information taken from Perfect World China International. 1) Only catapult can destroy turrets and crystals. Players either kill other players on opposing faction to slow down the other team and/or pulling cata. 2) Cata puller is usually someone with high base HP, can take multi hit from both turrets and players (this assigned but not limited to: Barbarian, Blademaster, Seeker, HA Veno). 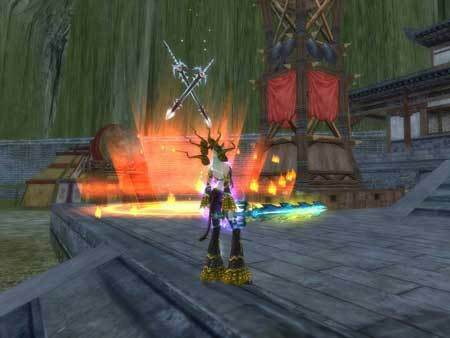 3) Once cata puller dies, cata will quickly losing HP and get destroyed. Even faster if the cata is near opponent's turret. 4) Cata puller must be able to control where the cata is. If the cata is too far, then cata puller needs to slow down or he/she loses the cata. Kinda like how follow button works. If the follower is too far or hit a wall, then the follower stops following. 5) Turrets and Crystals can regenerate HP by themselves. Use soul degeneration/diminished vigor to slow down the hp recovery. 6) Turrets have various debuffs depending on which kind of turret. Some turrets cause freeze, seal debuffs. All turrets cause debuff that lets you take more damage overtime, the longer you have this debuff. Turrets will attack anyone that are close by (but not everytime). I'm not exactly sure how someone can get aggroed by turrets. I healed cata puller on one of TWs I attend. Sometimes, I do get hit eventhough cata puller is closer to the turret than I do. Absolute Domain/Ironguard Powder/Tranquilizing Orb/Pan Gu Essence/Sutra Power Orb will protect you from getting hit continously by turrets. 7) Turrets have long range, enough to hit a sage archer spamming BoA from max range. mostly consists of barbs/BMs/seekers (or cata puller in general) and clerics. There is usually more than 1 cleric in this squad, just in case 1 cleric dies, the other revives and purify the seal afterwards. They are accompanied by strong crowd controller/AoE DDs such as BM, psychic, mystic, veno. Basically, their job is going on A or C lane and destroy the side turrets. They can also go on B lane if they think that they are strong enough and can faceroll opponents quick. mostly consist of strong AoE DDs such as archer, wizzy, seeker. 1 or 2 clerics or 1 cleric, 1 mystic is good enough for this squad. Their job is to kill opponents and slow down opponent's attack on turrets (basically surpress opponent's attack) or keeping pressure on opponents (if on attacking mode). Usually, stay on B lane most of the time. Can go on A or C lanes if opponents decide to switch attack to the sides or if TW leader decides to switch strategy. mostly consist of assassins and undergeared/lowbie members. Their job is to patrol the usually empty A or C lane and tell the squad if opponent's cata coming out of A or C lane. This job is perfect for assassins since they can hide in stealth without being revealed by opponents. Work with defense squad to tell whether those AoE DDs need to move lane or not. A strong sin can sneak in and kill the cata clerics to slow down the cata.